Suharto ruled Indonesia for more than three decades, before being ousted on a wave of popular discontent in 1998. Under his presidency, investment from the West was encouraged and Indonesia enjoyed rapid economic growth. But the Asian financial crisis in 1997 provoked a wave of unrest among the poor, students and the burgeoning middle class, which led to his overthrow. Suharto, who used only one name in common with many of his countrymen, was born in Java in 1921. Accounts of his early years differ, but his family is known to have been large and poor. During World War II, Japanese forces occupied Indonesia - then part of the Dutch East Indies empire. The young Suharto was trained by a Japanese-created militia. At the war's end in 1945, incumbent president Sukarno declared independence from the Netherlands, sparking a bloody anti-colonial struggle in which Suharto played a leading role. The Netherlands finally handed over sovereignty four years later. Suharto managed to work his way up the ranks of the armed forces, eventually becoming a senior general. In 1965, a botched coup attempt eventually propelled him to power. Exact details are sketchy, but on the morning of 1 October, six senior right-wing generals were captured and murdered. Suharto himself was not at home at the time, and was not caught up in the sweep. As one of the few surviving top generals, Suharto played a key role in the political turmoil that followed. Communist sympathisers were blamed for the killings. In a wave of retribution that swept across Indonesia, hundreds of thousands of apparent communists and leftists - as well as members of the envied Chinese community - were massacred. 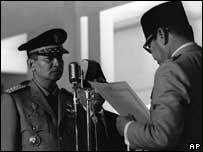 The bloodshed ended the political power wielded by Sukarno, and Suharto was named president in 1967 - a position that was formalised the following year as a result of legislative elections. Suharto was re-elected every five years until his downfall - but his success at the polls was unsurprising as electoral laws limited the number of parties and stifled opposition. Although members of the powerful military were banned from political parties, 100 seats were set aside for them in the electoral college. The system of dwifungsi - dual function - formalised army involvement at every level of civil government. Whereas his predecessor had called himself the "father of modern Indonesia", Suharto considered himself the "father of development", using Indonesia's vast natural resources to create a modern infrastructure. Combining economic liberalism with ruthless discipline, Suharto led his country from poverty to relative prosperity. But economic growth came at a price. Suharto's regime was repressive. He ignored demands for political reform, and was regularly accused of corruption and human rights abuses. After the collapse of the Portuguese overseas empire in 1975, Suharto sent troops to annex East Timor - one of Portugal's former colonies. As many as 200,000 people - about one-third of East Timor's population - are thought to have been killed or died of hunger during the occupation. Indonesia eventually agreed to East Timor's independence in 1999. In later years, Suharto acknowledged that errors had been made. "In transforming our nation," he said, "we may stumble. We are not trying to hide this fact." As an old-fashioned nationalist, Suharto kept Indonesia officially neutral in international disputes, as a member of the Non-Aligned Movement pioneered by Sukarno. However, Suharto was widely viewed as pro-Western, and the West viewed him as a bulwark against communism. His party, Golkar, fostered Pancasila, a state ideology which was an amalgam of beliefs and which provided for social harmony. For instance, even though 80% of Indonesians were Muslim, Suharto did not want the country to become an Islamic state. Indeed, the Indonesian state officially marked the holy days of several major religions. But the rigid system put in place by Suharto unravelled quickly amid the catastrophic collapse in the country's economy in 1997. During the Asian financial crisis, there was a run on the banks as people rushed to take out rupiahs before the currency could depreciate even further in value. Shops were stripped of their goods as panic-buying affected the whole country. The International Monetary Fund (IMF) was brought in to bail Indonesia out with a series of stringent economic measures. But it was too late for Suharto. Indonesia's poor, many of whom had lost their jobs, took to the streets in a frenzy of rioting and looting, which, together with student protests, eventually forced him from power. After his downfall, Suharto evaded prosecution on charges of corruption and human rights abuses, despite continuing demands by protesters. Suharto's opponents accused him of collecting a fortune during his rule. The former president and his family were estimated by Time magazine to have amassed some $15bn (£8bn) during his 32 years in power. Suharto denied the charges and sued Time for defamation. An Indonesian court ruled in his favour, saying he should be awarded more than $100m in damages. Time was still appealing against the ruling as he died. 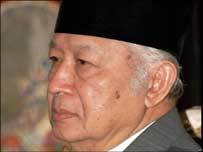 Prosecutors had also wanted to file criminal charges against Suharto, accusing him of corruption. But in 2006, after doctors testified that a series of strokes he had suffered had left him brain-damaged and unfit to face prosecution, these charges were dropped, causing outrage among his critics. Ultimately, however, the man whom the corruption watchdog Transparency International described as the greatest kleptocrat of all time and who, for so long, had wielded ultimate power in his country, ended his life a sick, reclusive figure, seemingly out of touch with the new, democratic, Indonesia.